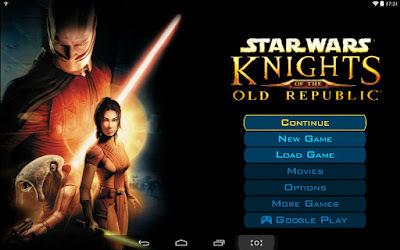 I've found that for a lot of people, whether they do or don't like SWTOR seems to depend largely on whether they feel that it is or isn't enough like the original Knights of the Old Republic games. I've always felt a bit out of my depth when people argue about this, as I never played either of the KOTOR games and have therefore always judged SWTOR purely on its own merits (and based on how much it reminds me of my favourite parts of WoW I suppose, can't deny that). 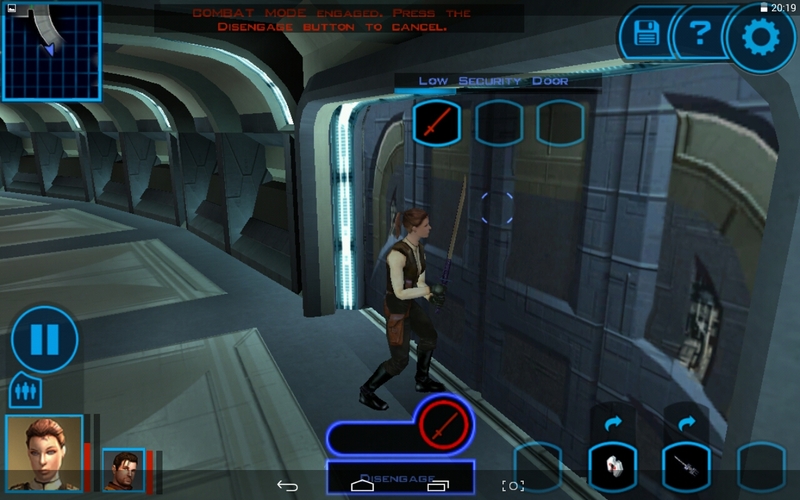 People have repeatedly recommended that I give the KOTOR games a shot as they are supposedly still good and enjoyable, but my problem is that I just don't fancy playing single player games anymore, not when I have the internet at hand anyway. However, two weeks ago an opportunity arose: I was going on holiday and knew that I was going to be away from the internet for a week. I was still going to have my tablet with me though, and guess what's available as a "mobile" game these days? So whenever I had finished my proper holiday activities for the day, I sat down in bed for a couple of hours and dove into the original KOTOR. I played for about eight hours that week and barely got off bloody Taris! But first things first. The graphics are a bit meh by this point but still hold up alright. They just reminded me of how everyone was switching to 3D around the dawn of the millennium, even though the technology was nowhere near ready to produce anything as beautiful as the pixel graphics that were the standard at the time, which led to the bizarre situation of some sequels actually looking worse than their predecessors (Dungeon Keeper 2 comes to mind). Fortunately KOTOR already isn't too bad, though there isn't really enough variety in character models for a game with this many NPCs. All the ugly male twi'leks I've talked to sort of meld together in my head. Something that isn't the core game's fault but the port's is that movement is a real pain on the tablet. I wish they'd made it tap to move or something. Instead you constantly have to press and drag to move your character around, which has resulted in me constantly running into environmental obstacles or getting myself boxed in. Just walking from one room to the next shouldn't be this much of a challenge. The combat is turn-based and has been a bit boring so far. I wish there was an option to not have to confirm things by pressing the "play" button for every single round but to instead have it running non-stop and only pause when I want to actually change things up. Having to hit "play" twenty times to bash down an inanimate object such as a door or strongbox is not exactly engaging gameplay. Since there are no tool tips for anything, I'm also largely in the dark about what a lot of my special moves actually do. When is it better to power attack instead of critical attack? Maybe that information is hidden away in a menu somewhere, but it's certainly not obvious. After I suffered a couple of deaths, the game got me to at least use medpacks though. The game starts off with your character being roused from her sleep by a guy called Trask Ulgo because you're about to miss the battle of the Endar Spire. As a SWTOR player, you're immediately in name-drop country, as everyone you meet and everything you see had either a server named after it in SWTOR (at launch anyway) or some sort of related item/clothing set released on the Cartel market. I'm not sure why people have strong feelings about the battle of the Endar Spire though. It's the freaking tutorial! Also, the cut scene at the end kind of shows the ship going "blap" in space, so it makes no sense that we find its wreck on the planet's surface in SWTOR. Your first companion is a Republic soldier called Carth Onasi (more Cartel pack armour!) who is what I would call a typical Bioware character, always wanting to be the good guy and coming off as kind of whiny at times in the process, though I found him sort of endearing anyway. Some things were familiar from SWTOR in a good way, such as the exiles in the undercity. Other times I was simply baffled by how much Bioware has been copying from itself. For example there is this side quest where you can step into a duelling ring, and guess what nickname you are given if you do so? "The Mysterious Stranger", just like in the Eternal Championship... similarly, I was quite surprised when I walked into a spunky blue twi'lek voiced by Cat Taber, voice actress of Vette, who soon became my companion. Talk about typecasting! I have to admit that finally being reunited with Bastila was pretty funny, and after that it didn't take long to escape the planet. Except! That bloody space battle with the Sith fighters. I'm not good at shooting games at the best of times, but the super awkard tablet controls (dragging to aim the gun turret, then tapping to shoot) made it nearly impossible to kill anything. What's worse is that there was no opportunity to save right beforehand, so every attempt required me to sit through the same six cut scenes and three loading screens again. Eventually I got annoyed enough that I googled for advice and found someone saying that if you spam shoot the moment the fight starts, you get a whole bunch of fighters at once that are initially positioned right in front of you. That ended up being the godsend that finally saw me through, though it was still only by a hair's breadth, as the Ebon Hawk seemed to be mere seconds away from exploding when I accidentally managed to hit the last enemy ship. Oh, and if you have the urge to comment about a big upcoming twist or something of the like - save yourself the effort, I've already been spoiled. Though it's remarkable that it took as long as it did for me to run into that particular spoiler, considering that the game is thirteen years old and I've been playing SWTOR for nearly five. 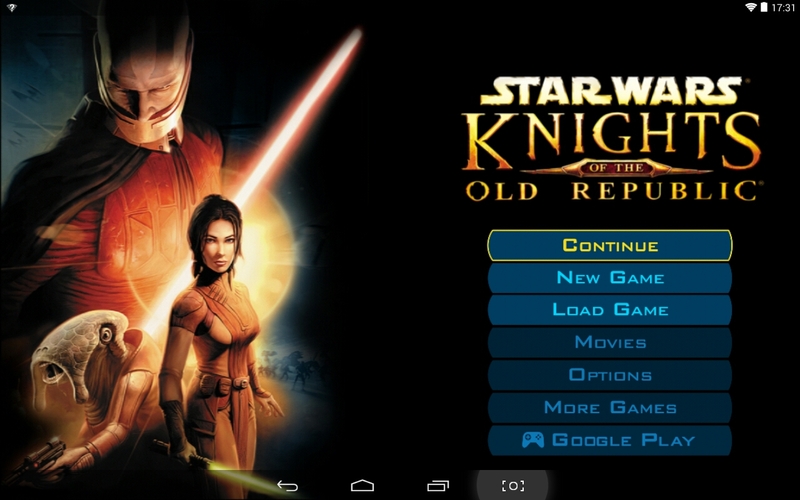 Yeah, KotOR definitely doesn't hold up as well as it used to. Certainly whenever I try it on my current PC the graphics of the background areas go absolutely haywire and change constantly depending on which angle you happen to be facing. I would never imagine even trying to play it on a tablet. For combat, I found it easier to deactivate the pause which constantly interrupted proceedings. It made things flow much smoother, but I don't know if that's possible for a tablet "port" (what strange terminology that is; why not name it something simple like 'version', I wonder?). I didn't know that there was such a big fuss over the Endar Spire battle, and even I can't see why this is. The music is excellent in that scene, though. Whilst I agree that neither Pazaak nor Swoop Racing would make good additions to SWtOR as they are, I think people are just after something akin to a "leisure" activity as other MMOs have done and these two are the only things which come to mind as having a precedent in the Old Republic series. At least it's not bloody fishing! But I like fishing! :P I would agree though that it wouldn't really fit into SWTOR. I'm not against more side activities I guess, but I'm really not too enamoured with these examples. Also, we already have things like the original space game and GSF lying around getting little love, I don't want them to add more activities that then won't get supported in the long run. Hmm, I'll have to take another look at whether there isn't an option to deactivate the auto-pause somewhere after all. Haven't had any issues with the background graphics, those are actually quite good-looking. I can see them trying to put swoop racing into SWTOR as a "Mario Kart" style event, but for me that's a bit much. Yeah, these games are so dated now. We tried to go back to Neverwinter Nights 2 a year or so ago and the controls were awkward and fiddly compared to the MMORPG standard of today. 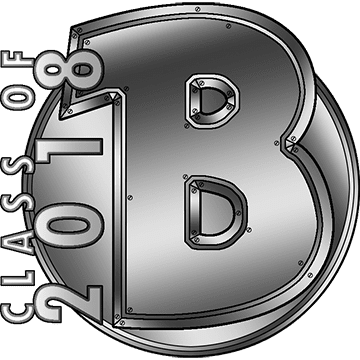 I loved playing KOTOR, but then I had the SWRPG (d20) and loved how the games implemented that roleplaying game into a computer game. Having non-combat skills like slicing (computer use) and persuade (the non-force variety) were nice touches. SWTOR has some of these conversation options but I think they're more based on an assumption of your classes abilities than anything you've chosen to specialise your character in. I never really bothered with pazaak and the swoops when playing the KOTORs so I'd not bother with them in SWTOR either but as commented above some more side activies for the MMO would be nice. I can't really remember a huge amount about the game other than really feeling like it was an immersive RPG experience at the time - and that was when most of the Star Wars gaming possibilites involved shooting things (the various FPS titles like Jedi Knight) or flying things (Tie Fighter etc). It does have quite a lot of depth and I can see how that must have seemed pretty amazing back in 2003. I'm actually kind of surprised how little difference there is in that regard when you compare it to newer Bioware titles. Seems there hasn't been much innovation in terms of gameplay when it comes to RPGs over the past ten years, just better graphics mostly.